With a mission that addresses the educational needs of the present and the future, Pacific Ridge School prepares students for college and a purposeful life. Our students understand that learning is a joyful, life-long pursuit, and that the world contains many kinds of classrooms. We invite you to learn everything you can about Pacific Ridge School. From open houses, info sessions and tours to sports events and performances, we offer many ways for you to get to know us. Come see why Pacific Ridge School is such a vibrant and engaging community. At Pacific Ridge, we have designed a curriculum that incorporates the best of traditional and innovative education. Guided by caring and experienced teachers, our students are encouraged to discover their passions, develop their authentic voice and apply their learning out in the world. Creativity can be found everywhere at Pacific Ridge. Our students immerse themselves in the arts and benefit from the expertise of a talented and dedicated faculty. Beautiful, state-of-the-art facilities house artistic endeavors of all kinds and offer a hub for creativity and innovation on campus. Athletic participation is a vital part of education at Pacific Ridge School. With students engaged on the fields and courts, just as in the classroom, Pacific Ridge School athletics promotes the pursuit of excellence and the rewards of ethical behavior. Pacific Ridge School’s supportive atmosphere and many opportunities for engagement foster a unique sense of community. From activities and clubs to arts and athletics, there is always something going on, and everyone is welcome. The school we enjoy today was built by the generosity and philanthropic support of our founding community, and we share a strong tradition and culture of giving. When Pacific Ridge parents, students, faculty and staff join together, there is no limit to what we can accomplish! Pacific Ridge sophomores Aliyah and Nadia Abudawas were selected by the San Diego Council on American-Islamic Relations (CAIR) to attend CAIR's Muslim Day at the state capitol on Monday, April 25th. 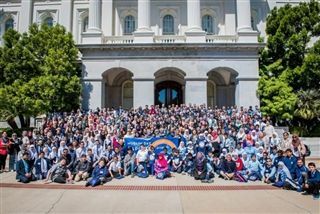 Aliyah and Nadia joined more than 600 American Muslims from throughout California to advocate for civil rights issues ranging from bias-based school bullying to law enforcement transparency. The sisters met with Senator Patricia Bates and Assemblyman Rocky Chavez to lobby for and against several current bills. Aliyah says the experience provided an eye-opening look into the political process.